At Promain we are often asked for anti slip paints. All paints offer some degree of anti-slip but it is difficult to determine each individual’s requirements. It is important to know how slippery your floor is. There is a level of friction below which people tend to slip over, and a level above where people are less likely to slip. This is known either as co-efficient friction testing or micro-roughness testing. The pendulum test has been designed to measure dynamic coefficient of friction (CoF). The test replicates a pedestrian heel strike, the point at which most slips occur. When a pedestrian heel strikes a wet floor a fluid film is created between them, this can cause a slip. This test works in wet conditions because it generates a similar fluid film between the slider and the floor. It can be used to accurately test the slip potential on clean and dry or contaminated floors. The test also works with dry contaminants. The HSE prefer this method of testing, because it is portable and works in the conditions that slip accidents are most likely to occur. So Which Product Would I Need? There are many types of anti slip products available. From single pack Alkyd products such as Coo-Var Suregrip to Polyurethane coatings that are extremely flexible. The flexibility of the Polyurethane coatings makes them ideal for application to wooden structures such as jetties, ramps and decking. Protecta-Kote is another good anti-slip product. It contains rubber crumb to provide the anti-slip finish, and should the worst happen, the rubber crumb also provides a softer landing. Protecta-kote is also available in Protecta-Kote UVR, which also provides protection against heat and salt water – making it ideal for boats. A product that we regularly sell is Safe-Kote. This is a low profile non-slip paint which is suitable for both exterior and interior applications. It can be used on boats, ramps, laminate flooring, fiberglass and any area where an anti-slip surface is required. Similar to the Protecta-Kote but with a much finer aggregate, Safe-Kote is available in 8 colours as well as clear. We regularly specify Safe-Kote for use on floor tiles in changing rooms and showers. The benefit is that it is not too harsh on bare feet. What If I Need Anti-Slip For A Harder Wearing Surface? For areas where a much harder wearing surface is required (areas such as ramps used by fork lift trucks etc.) we have 2 pack epoxy paints including Sigmacover 2 and Sigmacover 400 from PPG Marine and Industrial. In a recent project carried out on the footbridges over the river at Bedford, PPG Epok Tread was specified. Expected to last well in excess of 15 years, this product is an ideal long term solution. 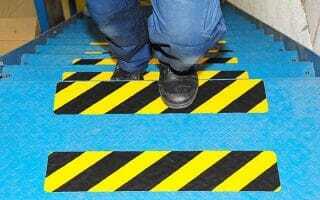 A relatively new product used in combating accidents caused by slipping is GRP – Glass Reinforced Plastic. This has a nosing which is suitable for step edges and can be applied quickly to steps with either glue or screws. Leaving the product flat makes it ideal for access ramps for wheelchair users or anybody who has trouble using steps. The GRP can even be coloured bright safety yellow. This then highlights any hazard i.e. an edge of a step, by making it stand out in low light levels. Over the past few years Promain have supplied Anti-Slip GRP to many councils and local authorities. We have supplied products which have been used on pedestrian bridges over rivers, roads and step edges for fire escapes at both industrial and residential sites. Probably the quickest and cheapest form of anti-slip are anti slip tapes. 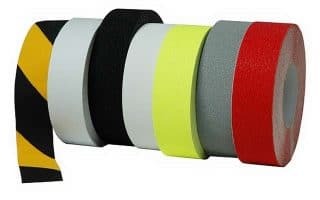 Supplied as rolls, the tapes come in a range of sizes. We can also custom cut them to suit each individual’s needs. These tapes are easy to apply to stairs and steps. The Centrecoat Conformable Safety Grip Tape also has a rather clever trick. It has the addition of a thin aluminum backing which molds itself to the substrate. Ideal for applying over checker plate – a metal sheet with a ribbed texture, designed to provide a degree of slip resistance. Sadly the checker plates prove to be inadequate in many cases. Anti Slip Aqua Safe Tape has proved to be a real benefit in reducing falls especially in wet areas such as showers and the areas around swimming pools, which can become very hazardous when wet. This tape, often specified in clear, offers a low profile – essential when young children are running around with bare feet. 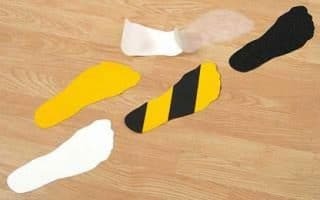 Finally, a fun way of teaching school children about slip resistance is the use of cut outs such as Pre-Cut Anti-Slip Feet. Available as a bare foot design (complete with individual toes! 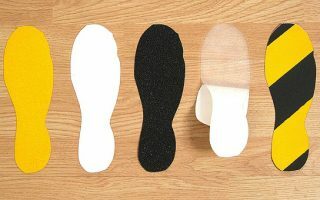 ), a foot outline, or even a shoe outline, these self adhesive anti slip feet are a fun and safe method to show exits and to give direction around schools, leisure centres and more. As you can see this is just a small insight into the ever increasing world of anti-slip products. We hope this article helps you to understand that there are solutions out there to aid reductions in accidents around the work place and at home. If you are looking for an alternative to cheap anti slip floor paint or anti slip tapes, which will allow you better protection, please give us a call today to discus your requirements. We are sure to have a product that will suit your needs. In addition we can provide you with technical assistance on products and application. You may also be interested in reading our article on anti slip products that are suitable for use around animals. This is particularly useful for vet practices, kennels, catteries, owners of horse boxes and many more. You can find the article by clicking on the following link: Slip Resistant Flooring for Kennels Catteries and more!